We’d love your help. 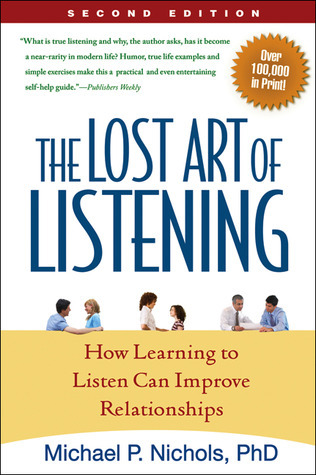 Let us know what’s wrong with this preview of The Lost Art of Listening by Michael P. Nichols. To ask other readers questions about The Lost Art of Listening, please sign up. how to read any book??? How many people are unheard while their mouths are breathing their hearts? 1) Like a lot of psychology books, it could have been condensed to maybe half the length by cutting out generalized and extraneous case studies/examples. It is also very repetitive I only give this book three stars (I liked it) but would still say everyone should seriously consider reading it. I see how he wrote this. He came up with the idea of a book, and he jotted down notes between counselling sessions and meetings until he'd filled an exercise book. Then he grouped them loosely into themes and wrote the book. The result is a bundle of platitudes, anecdotes, and advice which have no connection beyond their overall topic. He would have been better to write a collection of short essays rather than feign a linear narrative out of them. Definitely some useful thoughts in there, but pr I see how he wrote this. He came up with the idea of a book, and he jotted down notes between counselling sessions and meetings until he'd filled an exercise book. Then he grouped them loosely into themes and wrote the book. "Listening isn't a need we have; it's a gift we give." That is the last line of the book and a great take-away. If you want to be a better listener, and really, don't we all, there is much to glean from this book. gender. One minute he rebukes people for giving in to gender stereotypes the next he gives into them himself, thankfully. Have you ever felt your words fall on deaf ears? Have you ever felt like you didn't know how to listen to someone when they really needed you to? In The Lost Art of Listening, Michael Nichols frames listening as an active art - we need practice to transform passive reception to real hearing. As a future counselor or teacher, this book grabbed me from the get-go: not only does Nichols discuss how to listen more effectively, but he also brings up the benefits of listening and the consequences of mi Have you ever felt your words fall on deaf ears? Have you ever felt like you didn't know how to listen to someone when they really needed you to? I absolutely loved this and would recommend it to anyone and everyone. The author comes off as generous, empathetic, and warmly funny (in a dad humor kind of way). It's given me a lot to think about. A perfect book to set the tone for the new year. This book drives home very deeply just how important listening is to any conversation and relationship you have. The stakes in our interpersonal communication are much higher than you think and the book helps you tune into the pitfalls that occur as we struggle to understand those around us. The first section This book drives home very deeply just how important listening is to any conversation and relationship you have. The stakes in our interpersonal communication are much higher than you think and the book helps you tune into the pitfalls that occur as we struggle to understand those around us. The first section describes how good listening is the difference between isolation and acceptance. In our fast paced culture, it is the rare person that really takes the time to understand and this section really underscores how much of a vacuum is created in our relationships when folks don't really feel understood. Understanding and cultivating 'empathy' is a large focus here as the author illustrates just how much your child's development is impacted by your ability to truly listen and understand your child. To be quite honest, this section truly shamed me and really gave me a standard to live up to... e.g. our ability understand and be understood is a truly a lost art in 21st century America and we could all use a dose of understanding what true empathy is. A very telling quote is "People who don't talk to us are people who don't expect us to listen". Key questions that truly shape us are: Does the person who isn’t very forthcoming with you have reason to believe that you’re interested in what he thinks and feels? That you’ll listen without interrupting? That you can tolerate disagreement? Anger? Openness is a product of interaction. encourages the speaker to go deeper into his or her experience." What turns conversations into arguments? The author proposes that high emotional responses are the number one factor in letting a conversation get out of control. The ability to listen rests on how successfully we resist the impulse to react emotionally to the position of the other. A helpful examination of when you reacted emotional can unlock some facets of your familial communication and past situation that is really causing you to act in an emotional way. This is easier said than done. subtext. It means listening without being in a hurry to take over. We are taught in the professional world to take control of conversations, so it is no surprise that most Americans find this extremely difficult. If you are trying to lead an organization, the last thing you may want to do is let someone else drive, but, paradoxically, that is precisely what we must do if we want meaningful connection. Also, we cannot respond to anger when it presents itself, we must let it run its course and avoid the 'calm down' tendency we want to publicly pronounce (i must admit, i have said this in the past and this will not calm anyone down). Another paradox that i found was that offering personal experience to someone you are talking to is, in most cases, the wrong thing to do. True listening is getting the speaker to tease out how they feel and letting them explore their feelings.. offering examples essentially 'steals the floor' and puts the focus back on you. This can sabotage connection at a critical point in a budding friendship. I finished! Yay! Honestly, it was an okay. The biggest problem is how the book is organized. It's like his stories and his notes were everywhere. I also had a hard time staying engaged in the book and there were some things I already knew. BUT... I did learn several techniques to become a better listen. I noticed how I say things that make me a poor listener and I like that I can recognize it in myself. One thing that I love is when he says: "Under what circumstances do you become reactive and g I finished! Yay! Honestly, it was an okay. The biggest problem is how the book is organized. It's like his stories and his notes were everywhere. I also had a hard time staying engaged in the book and there were some things I already knew. BUT... I did learn several techniques to become a better listen. I noticed how I say things that make me a poor listener and I like that I can recognize it in myself. One thing that I love is when he says: "Under what circumstances do you become reactive and give advice or interrupt or make jokes instead of listening?" Genuine listening involves a suspension of self. Holding your tongue while someone speaks is not the same thing as listening. To really listen, you have to suspend your own agenda. Forget about what you want to say, and concentrate on being a receptive vehicle for the other person. Just because something is simple, doesn't mean it's easy. Actively listening is much harder than we believe it is and this book covers the subject from so many aspects. The author is a family therapist and his wisdom c Genuine listening involves a suspension of self. Holding your tongue while someone speaks is not the same thing as listening. To really listen, you have to suspend your own agenda. Forget about what you want to say, and concentrate on being a receptive vehicle for the other person. Just because something is simple, doesn't mean it's easy. Actively listening is much harder than we believe it is and this book covers the subject from so many aspects. The author is a family therapist and his wisdom comes from years of helping individuals, families and couples to figure out better ways of communicating - which starts with cultivating better listening skills. How we communicate - and listen - goes back to how we learned to do that in our families. Our parents may be the most important unfinished business of our lives. When you are trying to figure out why you or anyone else overreacts, keep in mind one of the great ironies of understanding: We are likely to be as accepting of others as we are of ourselves. That's why those lucky enough to be raised with self respect make better listeners. If you learn to respect other people's feelings, you will learn to treat your own feelings more kindly in the process. What we can't tolerate in others is what we can't tolerate in ourselves. A relationship isn't some you have, it's something you do. Sometimes marriage isn't about resolving differences, but learning to live together with them. Second and third marriages don't fail because people keep picking the wrong partners. They fail because it's not differences that matter, but how they are negotiated. While he addresses listening in the work place in very effective ways, I found the most interesting parts of the book to be about the challenges of listening to the people who matter the most to us - our family members. Ironically, our ability to listen is often worst with the people closest to us. Conflict, habit and the pressure of emotions makes us listen least well where listening is most needed. As we move outside the family circle to those we care about but don't live with, we tend to be more open, more receptive and more flexible. Primarily because those relationships are less burdened with conflict and resentment. In struggling to figure out just how much bandwidth I have to truly listen to the people I engage with everyday, I've come to the conclusion that not every person I encounter needs my full and undivided attention. In fact, there are people who demand attention in ways that mean it's being taken away from others in my life who are important to me. Social media demands attention in ways that are often overwhelming and many times unproductive. Emails come flowing into several email accounts at all hours, seven days a week, with an immediate response expected. So intentionality is required to make certain that the people who should have our undivided attention are the ones actually getting it. Sometimes it makes sense to write off unrewarding relationships that aren't central to your life. That is a hard thing to do. Ultimately, saying "no" to that which is unrewarding means leaving more room for that which is rewarding. I chose this book because: 1) it was so highly recommended, and 2) this is one of the core skills of my career (leadership coach, consultant, boss, etc.). To be honest, I didn't expect to learn a ton. I just wanted to remind myself of what matters and add a classic in my field to my tool kit. But it was such a good book that I learned a lot. Fundamentally, it's the same truth that I know and teach. But his ability to explain WHY the techniques work--and when they don't work--was the best I've rea I chose this book because: 1) it was so highly recommended, and 2) this is one of the core skills of my career (leadership coach, consultant, boss, etc.). To be honest, I didn't expect to learn a ton. I just wanted to remind myself of what matters and add a classic in my field to my tool kit. But it was such a good book that I learned a lot. Fundamentally, it's the same truth that I know and teach. But his ability to explain WHY the techniques work--and when they don't work--was the best I've read or heard. One example of a great nugget is (paraphrased in my own words): When someone is complaining to you, they are actually making a veiled request. It could be for comfort, for validation, for you to respond emotionally, etc. You don't have to comply with their request. But you do need to acknowledge it. And if you can't comply, instead of just saying no, make an counteroffer with something you are willing/able to do. He took a lot longer to explain each of those pieces and give examples of how to do it well. But hopefully you can see that it's not just rote technique in this book. Topics include listening in general, plus how you adjust for: friends, co-workers, bosses/employees, spouses, parents/kids, etc. I listened to this book on Audible, and yep it will surely teach you how to listen. Not because of the many incredible lessons, but because those useful nuggets are buried deep within layers of repeated anecdotes and repetitive content that by the time you get to the end, you will have surely acquired the patience to actively listen. I recommend this book for skimming. It's a new perspective on relationships, and you'll see the world around you differently - not many people actually listen! Howev I listened to this book on Audible, and yep it will surely teach you how to listen. Not because of the many incredible lessons, but because those useful nuggets are buried deep within layers of repeated anecdotes and repetitive content that by the time you get to the end, you will have surely acquired the patience to actively listen. This is good for anyone, it not only explains how to truly listen but it goes way deep into interpersonal relationships in general. How to handle feelings, how to embrace differenced, how to not be defensive and so on. I can't even go into all the ways it was helpful because I listened to it on audiobook and I'm a horrible listener so although I felt like each chapter had useful information and i could make use of it right away, i usually forgot most of it. so i'll have to buy a paper version. R This is good for anyone, it not only explains how to truly listen but it goes way deep into interpersonal relationships in general. How to handle feelings, how to embrace differenced, how to not be defensive and so on. I can't even go into all the ways it was helpful because I listened to it on audiobook and I'm a horrible listener so although I felt like each chapter had useful information and i could make use of it right away, i usually forgot most of it. so i'll have to buy a paper version. See raamat mõtestab kuulamist ja seda kuidas me kuulame. Olulisimi märkus (neid on seal palju, aga mulle ehk suurima mõjuga): me enamasti kuulame selleks, et vastata, mitte, et aru saada. One of my top 5 books ever. Invaluable insight that leads us to really understand the nature and importance of human communication. This book made me a better mother, friend, boss/employee etc. If at first this book feels a little dry, I urge you to keep reading; It can change your life and that of all you come into contact with. *I first listened to this book on Audible and then purchased a hard copy for myself and another for a friend. I do prefer the Audible version if available to you. Very thorough unpacking of how people listen, why they listen, ways to improve listening. Includes examples and while sometimes it felt repetitive, there were nuances to each iteration and well worth exploring the dynamics of that iteration. This book brought up a surprising number of emotions during the reading that have been lingering with me ever since. The book covers a full spectrum of interpersonal communications as a friend, spouse, and parent. Nichols not only offers suggestions for improving communications but also makes his own confessions of his own communications failures in those areas and as a professional listener in his counseling practice. As an introvert I was surprised at the insight that this was often a defense m This book brought up a surprising number of emotions during the reading that have been lingering with me ever since. The book covers a full spectrum of interpersonal communications as a friend, spouse, and parent. Nichols not only offers suggestions for improving communications but also makes his own confessions of his own communications failures in those areas and as a professional listener in his counseling practice. As an introvert I was surprised at the insight that this was often a defense mechanism for people who weren't listened to as children. There's a tendency, he says, to give up on being listened to creating a shell of isolation, busy-ness, and reserve as a way to avoid opening up old wounds. I could see that. I came from a family where people were naturally quiet with each other. Disturbing that quiet could be cause for reproach. This is probably what lead me to two marriages with partners who were bubbly, vivacious, and terrible listeners. My late wife was well-meaning but even our daughters avoided opening up to her because of her odd listening style. You would start with a story about something that happened during the day and she'd interrupt with "What were they wearing?" "What was the restaurant like?" "What did people order?" She interrupted flow, shushed people when she was busy, and threw in her own opinions about how the speaker should have acted with advice for future encounters. We run across people like this every day, along with people who make themselves difficult to listen to by catching any open ear and telling in-depth stories that have no point. Trapped by some people like this I've actually stood at an office door, feet facing outward, looking over my shoulder, with the person continuing on as if I were hanging on every word. Most of us face challenging people who ignore us or have no sense of boundaries. And few of us are good listeners ourselves. It's more common to react than respond thoughtfully. Often we want to share similar experiences or offer advice, or something in the way others communicate will set off emotional reactions that have more to do with our life experiences than any actual content in the conversation. Nichols covers multiple topics and situations dealing with coworkers, spouses, and others. Each chapter offers exercises along with tips on planning alternate ways of approaching people with whom we have problems communicating. Along with opening up some memories that weren't always pleasant I found myself cringing when I heard descriptions of ways I am a less than perfect listener. But the tips are useful and realistic. The most general is to simply be interested in what people say. So when a person says: "I had a terrible night's sleep" you can avoid typical responses like "I did, too" or "Have you tried melatonin?" or "You should stop watching TV so late" and respond with things like: "That's a shame. Why do you think that's happening?" The ideas go far beyond what is generally described as "active listening" which, when poorly applied, can be more irritating than being ignored. I also appreciated that Nichols took aim at some gender biases that have increased with the "men are from mars" pop-psy that developed over the past few decades. About the only gender difference he mentions himself is that women tend to talk to friends face-to-face while men tend to talk during shared activities. Dealing with others as individuals rather than gender types can eliminate tons of problems at the very start. There are endless places where we can be better listeners. Nichols says this applies as much to newborns as it does to the elderly. We have an ongoing desire to be recognized as having lives worth understanding and emotions worth respecting. He also give advice for dealing with people who tend to explode with anger, or who latch onto any sympathetic listener, or who have trouble opening up. He provides some understanding for their motivations along with concrete suggestions. Solid theory, interesting stories, actionable exercise - this book has them all. 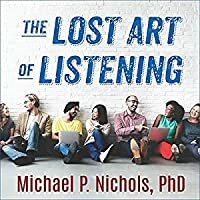 “The Lost Art of Listening” by Michael P. Nichols, worth to be reread a couple of times, balances between scientific approach, day-to-day examples, and prescription for treatment. This makes this book a manual for everyone who would like to work out his or her communication skills. The central idea of the book is a distance in communication with people we consider close to us (this also includes relations with friends, parents, and colleguaes). The book consists of four parts: “the yearning to be understood” , “the real reasons people don't listen”, “getting through to each other,” “listening in context”. The first part of the book explores an importance of the listening in human life. In this part, the author discloses the main message that will echo throughout the book “listening isn't natural, but developed skill”. He also claims that the gender differences plays a little role in our communication style (later he admits that “he needs space , she want closeness”, but the problem is not a gender differences in communication style rather it is “closed-ear” from both sides). In the second part, the author gives an answer of why people don't listen each other. It seems that A. own needs; B. prejudices; C. defensiveness (“we're most reactive to the things we secretly accuse ourselves of”) diminishes our listening skills to the point that we shut down after a while. The third part is more about the answers to how to become a good listener:“to listen well we must set aside memory, desire, and judgment”. Alongside with empathetic understanding, the author also urges to be outspoken in direct and clear way. The last part of the book restates the main ideas introduced in three previous parts, plus making a small addition about listening friends and colleagues. My parents have taught me: “Don't speak a lot.” The right way to say would be to “Listen more”. The book stresses a lot on the importance of listening and proves that sometimes the problem can be solved by just listening to the other position... The main idea of the book is that in order to listen well you have to master ability to suspend your own thoughts, feelings and their expression, so that the other person can speak up! There are a lot of cases which are not always related directly to the topic, however sometimes practical. Generally, you might find something interesting in this boo The book stresses a lot on the importance of listening and proves that sometimes the problem can be solved by just listening to the other position... The main idea of the book is that in order to listen well you have to master ability to suspend your own thoughts, feelings and their expression, so that the other person can speak up! The main point of this book is that in order to listen well you need to suspend your own thoughts and try to see and feel things from the other person's point of view. Obviously the book can be a bit tedious when you're basically reading iterations of that idea for over 200 pages. However, there are lots and lots of little gems that I flagged and copied down. In summary, this isn't the most riveting read, but it's a worthwhile read. If you haven't studied communication and don't bother looking at common assumptions about how people generate their narratives, this is the book for you. Incredibly basic, full of philosophical assumptions concerning communication and human psychology that are unsubstantiated, I'm at a loss as to why this is so often recommended. All well, not a complete waste of time if you're wanting to start somewhere. Lots of great applications and information. Sarcasm is lost a bit with the narration and I had to buy a hardcopy of the book for the exercises, but I enjoyed listening to this audiobook during my commute over a week and a half. This book offers some very good and practical advice. So much yet to learn as I apply myself to practice what I learned and work to become a better listener! "The reason we long so much to be listened to, is that we never outgrow the need to communicate what it’s like to live in our separate private worlds of experience. Unfortunately, there is no parallel need to listen. Maybe that’s why listening sometimes seems in short supply. Listening isn’t a need we have, it’s a gift we give." This was a very interesting and thought provoking read. It does tend to get a bit repetitive, but that's probably meant as a tactic to reinforce the themes and make sure "The reason we long so much to be listened to, is that we never outgrow the need to communicate what it’s like to live in our separate private worlds of experience. Unfortunately, there is no parallel need to listen. Maybe that’s why listening sometimes seems in short supply. Listening isn’t a need we have, it’s a gift we give." This was a very interesting and thought provoking read. It does tend to get a bit repetitive, but that's probably meant as a tactic to reinforce the themes and make sure the reader is actually listening and taking away the important lessons. I don't think that the author has uncovered any new theory about listening, but he does help to emphasize the benefit of empathetic listening and making sure you're trying to see every conversation from the other person's point of view. As human beings with faults, we tend to be quite self absorbed and we filter our experiences and conversations through an analytical and emotional lens...but sometimes we're really just meant to set all of our own shortcomings aside and simply listen. This book contained many different relationship scenarios, as well as topics of discussion that people have come to him for help with in the past. The author presents successful outcomes as well as examples where people never could quite resolve things. Some might find this disheartening, but I found it realistic and reassuring (no one can be perfect at communicating 100% of the time).